Given the turbulent changes to the global economy over the past 36 months, companies are intensely focused on marketing channels that effectively reach customers to speed the sales cycle and, positively impact top-line revenue. Simultaneously, companies are tightly managing marketing costs that were previously viewed as discretionary spending. In August of 2010, Aberdeen surveyed 453 executives regarding their 2011 Marketing Executive’s Agendas. The results were compelling with 61% of all companies stating that the increasingly competitive business landscape was the top pressure facing their marketing programs. As a result 84% of Best-in-Class companies are turning to email marketing as a central component of their multi-channel, multi-touch marketing initiatives to improve their competitive position. 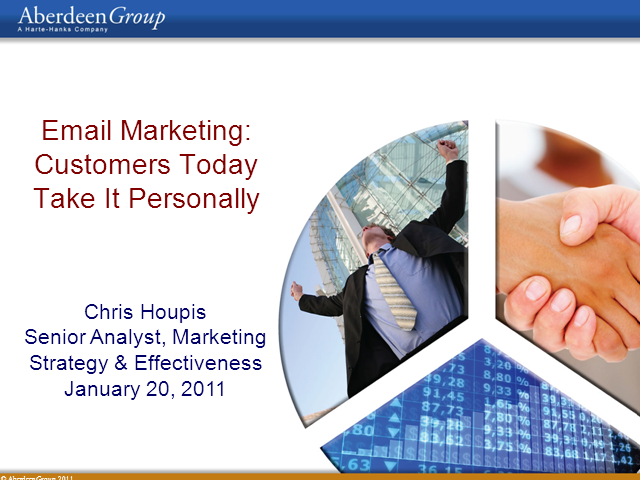 This upcoming Aberdeen benchmark report, publishing December 31, 2010, demonstrates and proves how the Best-in-Class marketing organizations deploy and optimize email marketing to deliver effective, and targeted communication to their customers to produce a positive, quantifiable impact on the sales pipeline.